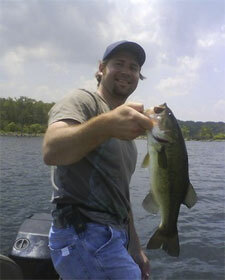 Testimonials | Fish Sense Lures home of the Binsky. Fish Sense Lures Happy customers. Appreciated customer testimonials from some excellent fishermen using our Binsky blade bait. 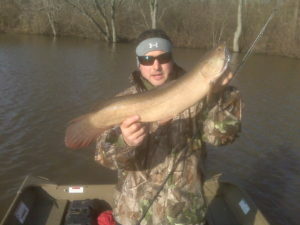 Just wanted to send you a picture of a bowfin I recently caught in Late January this year before everything froze again in New Jersey. Not my biggest , but we caught fish consistently all day on the bend of Point in 22′ water. Glad somebody stepped up and made a real blade bait! The blades have been working out great so far. The gold ¼ oz. has caught well over 150 walleyes in the three days I’ve used it but check out this piggy Flathead catfish I caught on it. It took 30 minutes on ten pound braid and medium action St. Croix. 42 inches. I was extremely excited when I saw a link to your bait on a forum I frequent, the reason being that your Binsky is something different. I live in CT and frequent one of the best smallmouth bass lakes in the north eastern US- candlewood lake. My first test for this bait was a tournament last Sunday and boy did they hit it good. We pulled up to our first spot and I proceeded to catch 2 fish on back to back casts. It was lock and load from there. 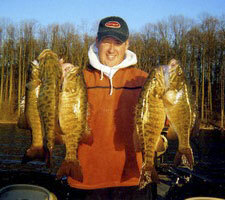 We put a dozen keeper smallmouth in the boat on the Binsky which brought us to a solid 16.90lb limit. Both myself and my tourney partner Dave were very impressed- it even out fished his favorite painted silver buddy! I have another tournament tomorrow and you can bet both myself and Dave will have one tied on looking for that edge that I think the Binsky can give us. Hi, I’m Jared and I was at this fishing expo in Massachusetts and purchased one of your lures and the weather had been nice so I went out and started fishing it bouncing the bait of the bottom in very deep weed structure and was getting hits all over and my buddy was getting so frustrated because he didn’t have one in his tackle box and I only had one but sadly one of the casts my line broke with a huge fish on it. When we packed up and left I was thinking this bait was amazing I should see if there is a web site and when I found this email address I just couldn’t pass up the opportunity to tell you how amazing your bait is. I feel when I do my tournament’s up in Maine and New Hampshire in April your bait will help me win and take the money! The Binsky is without a doubt the best lipless type jigging bait I have ever used. You can fish it in one to forty feet of water and is one of the best lure selections for deep water fishing during colder water conditions. Lake Fork Guide, Dean Stroman. Sponsored by Legend Boats, Mossy Oak, Mercury Marine and Century 21 Lake Country.